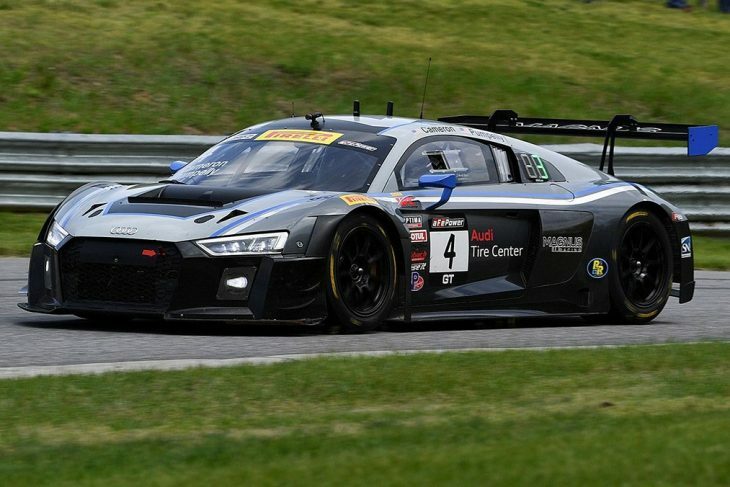 Dane Cameron and Spencer Pumpelly, driving the #4 Magnus Racing Audi R8 LMS, won Race 2, Round 6, of the Pirelli World Challenge SprintX Championship at Lime Rock. Second across the line was the #8 Cadillac Racing ATS-V.R piloted by Jordan Taylor and Michael Cooper. Taking the final podium spot in the GT Pro/Pro category was the #9 K-PAX Racing McLaren 650S GT3 driven by Ben Barnicoat and Alvaro Parente, with Barnicoat taking the car to the finish. Contact at the start between the #31 TR3 Racing Ferrari F488 GT3 with Niccolo Schiro at the wheel and the pole-sitting #58 Wright Motorsport Porsche 911 GT3 R driven by Marc Lieb resulted in Lieb being stranded at Turn 1, the #58 car out of the race. The incident allowed Jordan Taylor in the #8 Cadillac Racing ATS-V.R to take the lead with Dane Cameron in the #4 Magnus Racing entry tucking in close behind. The Safety Car period to recover the Lieb’s stricken Porsche 911 GT3 R lasted nearly nine minutes. As the race went back to green, Taylor held on to his lead with Cameron pushing hard in second place. Tom Dyer, in the #43 RealTime Racing Accura NSX GT3 meanwhile, had moved into third after starting fifth on the grid. Alvaro Parente in the #9 K-PAX Racing McLaren 650S GT3, was fourth. The top four positions remained unchanged as the race moved towards the pit-stop window, Taylor in the #8 car holding a slim .387 second advantage over Cameron in the #4 entry. A fast in-lap from Cameron and slick pit-work from the Magnus Racing crew meant that, after the driver changes had cycled through, Spencer Pumpelly in the #4 car lead the race with a 1.5 second advantage over the now second-placed #8 Cadillac Racing ATS-V.R with Michael Cooper at the wheel. 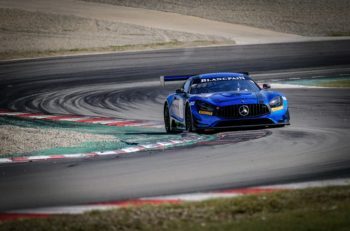 Pumpelly pushed hard throughout his stint, using traffic to his advantage, to extend his lead to over six seconds as the race approached the 60-minute mark. 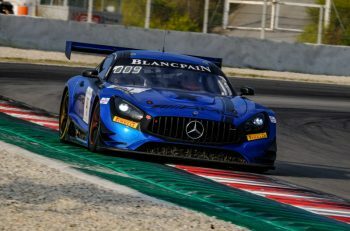 The on-track battle, however, in the closing stages was for fourth place where Ryan Eversley and Peter Kox in the two RealTime Racing Accura NSX GT3s kept up the pressure on Vincent Abril in the #88 Absolute Racing Bentley Continental GT3. Abril fought hard and was able to hold on to fourth as the chequered flag fell. Pumpelly and Cameron were delighted to come away with the win after the start-line chaos. Pumpelly entertained the crowd with donuts after he had crossed the start-finish line but revealed that some late-race contact caused him concerns in final laps. Michael Schein, driving with Jan Heylen in the #16 Wright Motorsport Porsche 911 GT3 R made up for some of the team’s disappointment at Lieb’s retirement by winning the GT Pro/Am class ahead of the #75 Autosport Nissan GT-R Nismo GT3 driven by Frank Montecalvo and Ricardo Sanchez. The GT Am/am class was won by the #30 MOMO/NGT Motorsports Ferrari F458 GT3, piloted by Henrique Cisneros and Tyler McQuarrie while the GT Cup Pro/Am category saw the #55 Dream Racing Motorsport Lamborghini Huracán Super Trofeo, with Alessandro Bressan and Yuki Harata sharing the driving duties, on the top step of the class podium. Two entries contested the GTS class with the #017 Case-It Racing Porsche Cayman GT4 Clubsport MR, driven by Adam Merzon and Trent Hindman taking the class win over the #019 Stephen Cameron Racing BMW M3 E46.